Consumers Beverages is proud to sponsor the 2018 Ballpark Brew Bash held this year at Coca-Cola Field! 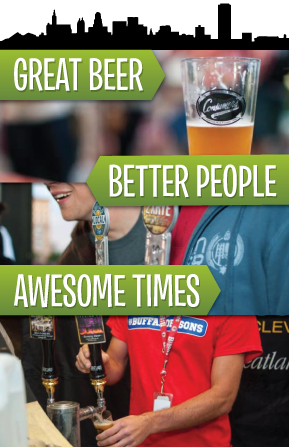 Join us on Friday, September 21st in beautiful Downtown Buffalo, NY for an evening of craft beer tasting and fun! Check out your favorite breweries from near and far, sample their latest releases, and get to know the people who make the brews. Tickets are now available at all 17 Consumer's Beverages locations, the Buffalo Bisons Ticket Office, and online at Tickets.com! Please join us as we carry on our tradition of helping worthy causes by indulging in our love of quality beer from some of the world's best breweries. 50+ breweries from across the globe will be in attendance and proudly pouring some of the finest craft beer available in the U.S.A. Your ticket includes admission to the event, a souvenir tasting glass, program, and 20 tasting tickets which can be redeemed for one (1) 3oz. beer sample each. 50+ breweries will be in attendance this year, each bringing several of the finest beers in their lineup. Additional tasting tickets are available for $1.00 each. The event is handicap accessible and outside vendor areas are tented in the event of inclement weather. No one under the age of 21 will be admitted and legal identification will be enforced. Please, no children or strollers. Also, please do not bring pets to the event. Designated Drivers (General Admission) admitted for a $5 donation fee (available day of the event). VIP DD are limited and only available in advance - $45.00. Copyright © 2014-2019 Ballpark Brew Bash.